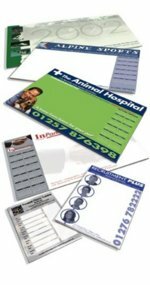 Sneak your business advertisement onto your competitors desks by giving away our Corporate Desk Pads with your printed business details and company logo. Choose which sizes that you require from these different sizes - A2, A3, A4, A5 and A6 and we'll see to every thing else. Corporate Desk Pads Sizes - A2 large desk pad, A3 Large desk pads, A4 note pads, A5 note books and A6 mini note pads. To find out more about our Corporate Desk Pads click here and fill in the contact form and we'll be in touch. Other promotional and personalised items besides our Corporate Desk Pads click here to view our entire range.